In December 2005 I visited my sister who lives in Hawaii and spent several days on Maui near a little town named Haiku. Outside of the cabin we rented, a bird-of-paradise bloomed, resplendent in bright orange, red, indigo and green. This is an inked impression of one of those magnificent flowers from that beautiful place. 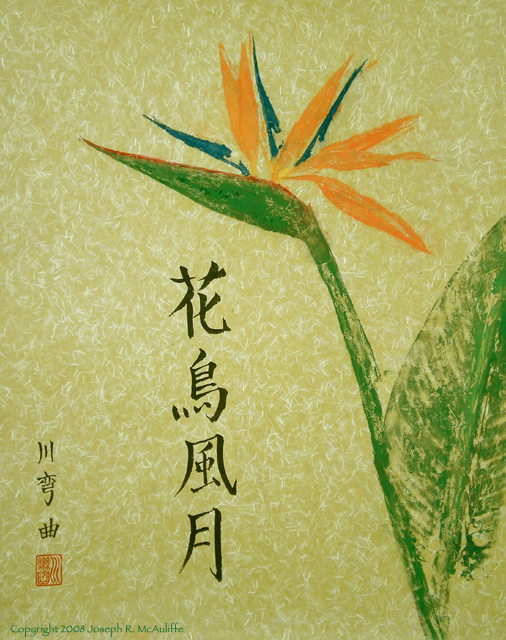 The inscription is a classic four-character idiom that reads (Japanese: kacho-fugetsu; Chinese: hua niao feng yue) which literally translates as “flower, bird, wind, moon” and refers to the beauty of nature. The literal meaning of the first two characters seemed particularly fitting for a bird of paradise flower.